In each bowl of ramen every ingredient contributes to the perfect balance, but when it comes down to it, the noodles and the broth are the heart and soul. Today we are breaking down the different broths and the unique flavour profiles in each simmering bowl of Nomiya ramen. Shio (salt) ramen is probably the oldest of the four and is a pale, clear, yellowish broth made with plenty of salt and any combination of chicken or pork, vegetables, and seaweed. A favourite of many Japanese locals! We use our tonkotsu soup base, and season with homemade Shio (sea salt) flavour – to give this ramen a well balanced flavour of pork and a light creamy broth. Tonkotsu (pork bone) ramen has a cloudy white coloured broth and has a thick broth made from boiling pork bones and fat, over high heat for many hours. This gives the broth a hearty pork flavour and a creamy consistency that rivals milk. It is a specialty of Kyushu, particularly Hakata-ku, Fukuoka (sometimes called “Hakata ramen“). Miso ramen features a broth that combines copious amounts of miso and is blended with our rich tonkotsu soup base to create a thick, nutty, slightly sweet and very hearty soup. Miso ramen broth tends to have a robust, tangy flavour, so it stands up to a variety of flavourful toppings: butter and corn, leeks, onions, bean sprouts, ground pork, cabbage, sesame seeds, white pepper, and chopped garlic are common. It will satisfy the deepest hunger! 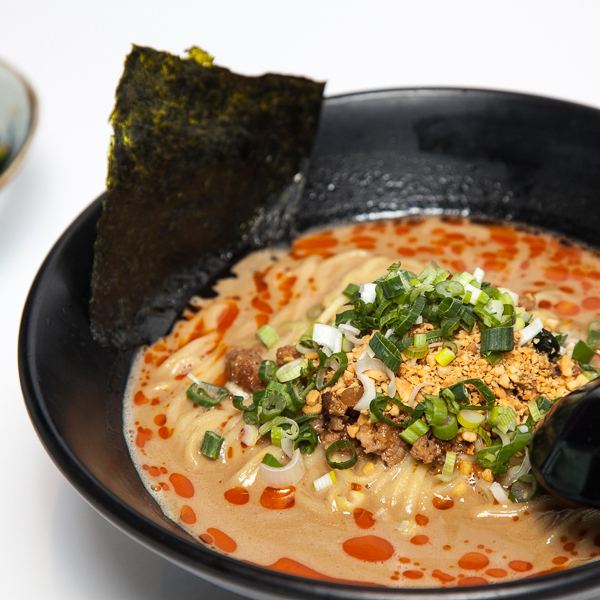 Or try our spicy miso ramen, which has a savoury kick to the traditional flavour. Simmering the broth for hours allows it to layer the flavours and gives it much more depth. This is exactly why our chef arrives at the crack of dawn to begin working on the broths each day! * All ramen soup (except the vegetarian ramen) is made with our special pork bone recipe that is simmered for over 8+ hours. Please understand that it is a pork flavoured soup and cannot be changed or altered during time of ordering.